Monterey's Cannery Row's Chart House restaurant is one of several Chart House locations that have won awards for not only their outstanding and creative seafood menu and prime rib, but for their spectacular waterfront views as well. The view of the Monterey Bay is indeed the best water view of any restaurant in Monterey. The restaurant has been designed to capture the best possible views from every table. Those who are seated farther away from the wall of glass have the advantage of a step up to a platform that insures the diners will be able to see over the heads of other patrons. 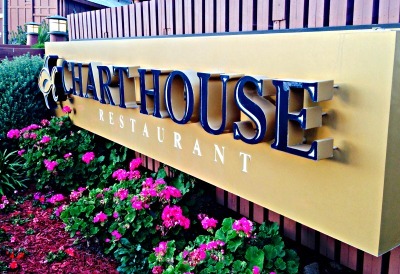 Chart House is the perennial choice for many who come to Monterey Bay. Yes, it's a chain restaurant with locations in Kona Hi, Lake Tahoe and other romantic places, but it seldom disappoints. This is a restaurant that is classicly perfect as a place for romantic escape, maybe even for an anniversary or special occasion. Almost fifty years ago the first Chart House Restaurant was open in a small diner in Aspen Colorado. Now with twenty eight locations in the United States and eight in California, one in Portland and another in Lake Tahoe, the Chart House enjoys a well earned reputation for innovative and creative food. This particular restaurant on Cannery Row is among one of ten Chart House Restaurants that have earned Open Tables distinction of the most scenic one hundred restaurants in the United States. The ceiling and walls are covered in dark wood and the tables covered with chrisp white linen cloth and the floor to ceiling views of crashing waves upon the ragged rocks of the coastline seemingly right under your feet, will enhance the potential for wonderfully romantic conversation. Whether your preference is for fresh caught seafood or slow roasted prime rib, the Chart House can meet the need. Fish tacos or firecracker shrimp for $6. Cocktails during happy hour are $6, a glass of wine is $5, and premium draft is $4. It's always difficult to choose from so many outstanding selections. My preference is usually for the coconut crunchy shrimp at $25 but there is something relatively new on the menu that might ease you selection process. The Chart House is known for seafood but the Prime Rib here is excellent as well. If your looking for a dining adventure, try the stuffed shrimp with crab and follow that with a giant slice of mud pie... no one makes it better. The "Distinctive Dining" Selection offers you an opportunity to choose a three course meal that includes salad, a choice of three main dishes and dessert for a paltry $29.95. This is easily the cost of an entry alone and leaves some opportunity for that bottle of wine or champagne you might be thinking about. As you relax in this idealic setting and the conversation continues, the time will come to decide on dessert. My suggestion is to not hesitate and perhaps share the house favorite of all time ... the Hot Lava Cake. This is the perfect finish for your romantic evening ...even if you leave some crumbs behind.